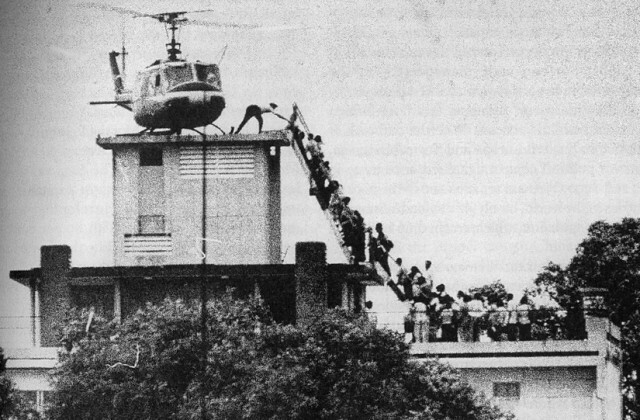 In April 1975, Saigon fell to the North Vietnamese Army, taking everyone by surprise. Panic ensued as Americans and South Vietnamese fled. For those who served in the South Vietnamese government or military, or the Americans, death was inevitable, so many did what they could to leave. 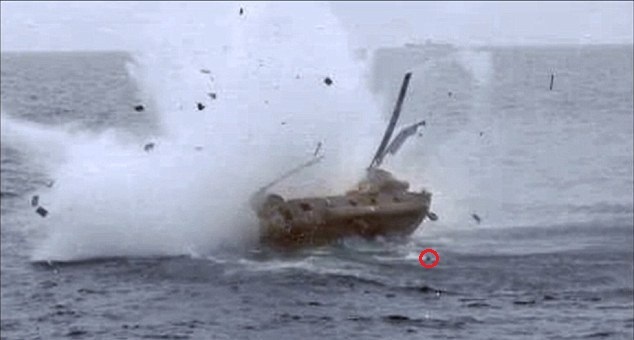 One South Vietnamese helicopter pilot entered history for how he did so – by nearly destroying an American ship. Although America’s official involvement in Vietnam ended in 1973 with the signing of the Paris Peace Accords, it took its time pulling out. By the start of 1975, the North Vietnamese government was getting impatient. The US still hoped to win the Cold War in the region. To justify their hopes, the CIA and US Army Intelligence published a report on 5 March 1975 claiming that they could easily hold South Vietnam till the end of the year. Possibly till late 1976. As that report was being released, however, North Vietnam was preparing to invade South Vietnam. It did so on March 10, capturing the South Vietnamese city of Buôn Ma Thuột. With that, the South Vietnamese military began a chaotic retreat. America had had enough of both Vietnams and offered no further support. Realizing the game was up, the South Vietnamese president resigned on national television on April 21. By then, his enemies were just 26 miles from the capital at Saigon. Everyone panicked and with good reason. In 1968, North Vietnam had briefly occupied the South Vietnamese city of Huế. When it was recaptured a month later, its leaders, military personnel, intellectuals, businessmen, Roman Catholics, and many others had been slaughtered. Although the Americans and other foreigners had begun leaving as early as March, it was a mostly leisurely departure. Those who had Vietnamese friends, common-law wives, and children refused to leave them behind. But the American Defense Attaché Office (DAO) required that protocol be followed, which greatly slowed down the legal emigration process. By April, however, the DAO began ignoring their own protocols and handed out illegal visas to thousands of South Vietnamese. Those who couldn’t afford a ticket were flown to the Clark Air Force Base in the Philippines, again illegally, since they had no permission to do so from American or Filipino officials. Ba Van Nguyen was a major in the South Vietnamese Air Force with a wife and three children. None spoke English or had friends among the Americans, so visas were out of the question. By April 27, the North Vietnamese had surrounded Saigon with 100,000 troops. Just before dawn on April 29, the city’s Tan Son Nhat Airport was attacked. With its runway and facilities destroyed, escape by plane became impossible. There was only one way out of the city – by helicopter. 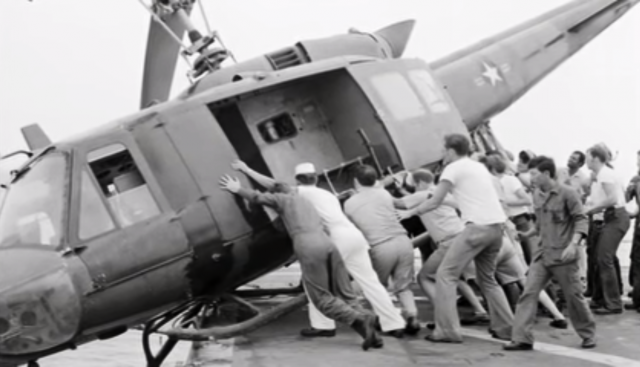 Operation Frequent Wind had begun, an attempt to save as many “at-risk” South Vietnamese as possible. Nguyen was desperate. His family lived in a Saigon suburb, so he knew he’d never get them to any of the American evacuation points in time. There was too much traffic as people flocked to the city, hoping to flee with the Americans. He told his wife to pack what she could and to get ready – he was coming back.